Newcastle United boss Alan Pardew says Brendan Rodgers can cope with the pressure of managing Liverpool, but has work to do in the transfer market. "I think Brendan can deal with it," Pardew told BBC Newcastle. "He didn't get the tools he needed and if you're going to create the vision he wants, you've got to have the tools." Rodgers said on Friday that he will be given money to strengthen his squad in January. "We'll have funds and I'm in talks with the owners at the moment, along with our recruitment team," he said. Injury to Fabio Borini, a summer signing, has not helped, although Rodgers' decision to offload Andy Carroll to West Ham United has reduced the forward options. Pardew continued: "As I understand it, he's a striker short. If he didn't want the big fella [Carroll], which we know because we were involved, then he should have had a replacement." The Magpies have won once at Anfield in the league during the Premier League era. This was a 2-0 victory which came in their first season post Football League in 1993-94. Two wins overall, the other in the League Cup, make for disappointing reading, with two draws adding to a bad omen for Newcastle. Pardew and Rodgers were colleagues working together as youth coaches at Reading, before going their separate ways. Rodgers made his reputation as an academy specialist before moving into senior roles, while Pardew stayed to manage Reading, before stints at West Ham United, Charlton and Southampton eventually led to his role at St James' Park. "He's come up a different route at Chelsea, done very well and then come into the game and not had very long time as a manager, but he certainly deserves his spurs of the Liverpool job," Pardew added. "We were both confident in our own ways, but I genuinely thought he would be a coach rather than a manager. "He has a natural association with the coaching ground, and those who watch Being Liverpool would sense that, he's sort of evolved into a manager more so. "I always felt I was the other type, and I actually did think of Brendan as a coach at a few of my other clubs but he's found his own route and fair play to him." The pair went head to head as rival bosses on two occasions last season, with Pardew taking four points from the six from Rodgers' Swansea. However, the difference in expectations at Anfield to the Liberty has already placed pressure on the Northern Irishman, notably after his former club knocked the Reds out of the Capital One Cup in midweek. 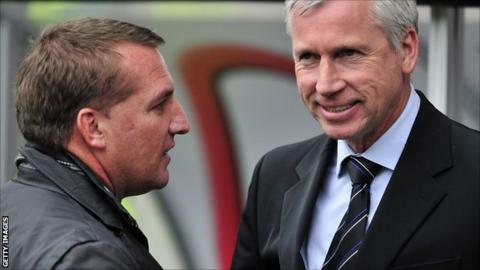 "Brendan's got to fulfill, it's a different scenario at a big club, and I can say that as I'm at one," Pardew said. "You do need a little bit of luck and you do need the right tools and at the minute probably two of those are missing."